There are 7 subway lines and 1 New Tram line. You can figure out which line you should take by checking each unique color. Each station is allocated a reference number. For example, Umeda station on Midosuji is M16. One day ticket is available at 850yen. For more detail, please refer to see this link. True to its name, the JR Osaka Loop Line (Kanjo-sen) runs in a loop around Osaka. It's not quite as convenient or heavily-used as Tokyo's Yamanote Line, but it stops in major station Osaka, Kyobashi, Tsuruhashi and Tennoji, and by Osaka Castle. 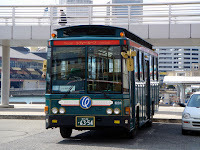 Namba and Universal Studios Japan are connected to the Loop Line by short spurs. Many private railway lines stretch all over Kansai region. Major railways are Hankyu(Kyoto-Osaka-Kobe), Hanshin(Osaka-Kobe), Keihan(Osaka-Kyoto-Shiga), Nankai(Osaka-Wakayama) and Kintetsu(Osaka-Nara-Mie-Kyoto). Please refer to this page for more detail. There are a lot of bus stops for limousine bus. You can check the bus stop and time table on this website.